Q&A with Claire Dupont, author of "Climate Policy Integration into EU Energy Policy"
Claire Dupont, author of Climate Policy Integration into EU Energy Policy, discusses her new book and its contribution to important climate research and events such as COP21. Why did Climate Policy Integration into EU Energy Policy need to be written? Climate change is one of the greatest challenges facing humanity today. Much of the human causes of climate change stem from burning fossil fuels for transport, heating and electricity generation – thus how we generate and use energy is at the core of the causes and responses to the climate problem. Despite the great scientific knowledge about climate change, our politicians still struggle to find effective climate policy responses. In the European Union, climate policy has advanced considerably over the years, yet even there, policy remains insufficient to tackle the scale of the climate challenge. It is clear that without strong, transformative climate policies in crucial sectors – such as energy – progress will be slow at best. This book takes a step back from the rhetoric around climate and energy policy in the EU. Integrating climate policy responses into the development of energy policy is a common sense approach to promoting climate policy, and policymakers have regularly described the benefits of such an approach. But a true assessment of how far the EU has succeeded in this integration was lacking. This book therefore provides empirical evidence on how much the EU has achieved and how much is yet to be done in the climate policy integration. It contributes to academic debates on policy integration in general, and societal and policy debates about how to mitigate the worst effects of climate change. The book thus contributes to filling a gap in policy studies and wider academic literature on policy integration, and also serves to provide evidence to policymakers so as to reflect on improving their record on climate policy integration. I hope that readers will take away the sense that we cannot take for granted that policymaking is holistic and that policymakers have all the crucial elements from other sectors in mind when making policy, but that improvements are possible. It became clear in the analysis that this is not always intentional on the part of policymakers – high-level political commitment to climate change is crucial for ensuring policy integration, coupled with knowledge and understanding among policymakers on how policies interact. This is an important lesson for all citizens, as it underlines the need to ensure constant awareness-raising among politicians and for continuous efforts at holding politicians to account on climate issues. Certain structural, educational and institutional steps need to be taken to ensure such holism develops and this is a matter of priority-setting. Are they any key messages you’d like to highlight? In the run-up to the all-important COP21 climate negotiations in Paris in 2015, the conclusions from this book more provide some sobering analysis on the leadership credentials of the EU. When it comes to climate policy integration in energy policy, the EU has made little to no improvement over time, and this is because the improvements in policy come too late. When a policy measure proves ineffective, the measures to correct this are often incremental improvements rather than the radical changes required to achieve the EU’s own 2050 decarbonisation goal (reducing greenhouse gas emissions by between 80 and 95 per cent). This can be termed ‘catch-up governance’ – as the time scale for implementing strong policy measures shortens, the improvements in policy are simply running after previous policy weaknesses. This raises broader questions about the EU’s leadership role on climate change internationally. It may have some of the world’s most ambitious policy measures, but it still does not succeed in implementing policies that are ambitious enough by its own standards. I would also like to highlight the contribution of the book to academic literature on environmental policy integration. While environmental policy integration has long been examined by academia, climate policy integration has often remained more within the realm of policy, without much conceptual thinking behind it. 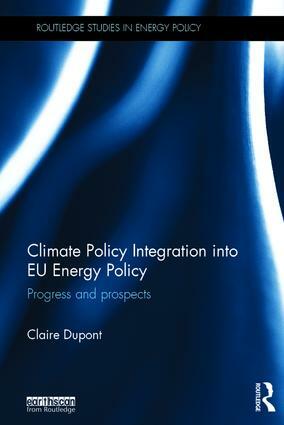 In this book, I conceptualise climate policy integration drawing inspiration also from theories of European integration. The exercise proved challenging, but rewarding, and allowed me to build on the conceptualisation for empirical study. I hope that future research in this field will be able to expand upon this conceptual work, and critically assess the elements I have used. What suggestions would you make for future research? I am particularly keen to see future research in this area, both empirical work and theoretical development. This book can be seen as among the starting points in terms of building empirical evidence of the reality of climate policy integration based on a conceptual framework that builds on environmental policy integration literature and draws inspiration from theories of European integration. New empirical studies in different policy fields (e.g. transport or agriculture), new energy policies, or different levels of governance would greatly enhance the empirical knowledge of climate policy integration. Theoretical development is needed hand-in-hand with such empirical analysis to refine further a framework for understanding climate policy integration and measuring its existence. As such research advances, we will have a stronger basis of knowledge for delving into debates around the value and implementation of related concepts, including environmental policy integration, policy coordination and mainstreaming. We should be able to engage in rich cross-sector comparative studies or studies on multiple levels of governance that may help identify other institutional factors affecting climate policy integration. How does this book relate to some current global events? I hope this book can contribute to the preparations, discussions and implementation of policies during and following the international climate negotiations in Paris in 2015. While the book focuses on the EU’s climate policy integration, the lessons drawn from the study should also be valuable in other jurisdictions. The importance of high-level political commitment to climate change, the need for policymakers to recognise the interactions among policy sectors, the understanding of how the policy process affects the level of climate policy integration, and a clear analysis of a particular institutional context are elements that can affect climate policy integration in other contexts. Furthermore, the book should serve as a wake-up call for the EU’s own internal policy development – no matter how ambitious EU policy may be in comparison to other actors’ policies, the EU is struggling to implement coherent policies in line with its own 2050 decarbonisation goal.